Broo is about to be killed by the alien from last issue who reveals he’s Professor Xanto Starlord a very famous intergalactic writer who Broo is a fan of. He plans to kill Broo because he disrupts the natural order of the universe by going contrary to typical Brood behavior. Kitty and the Bamfs ( small creatures that look like Nightcrawler and have his powers) luckily save Broo from an untimely death. Inside Kitty Beast and the X-men manage to stop anymore brood from spawning and exit kitty’s body. 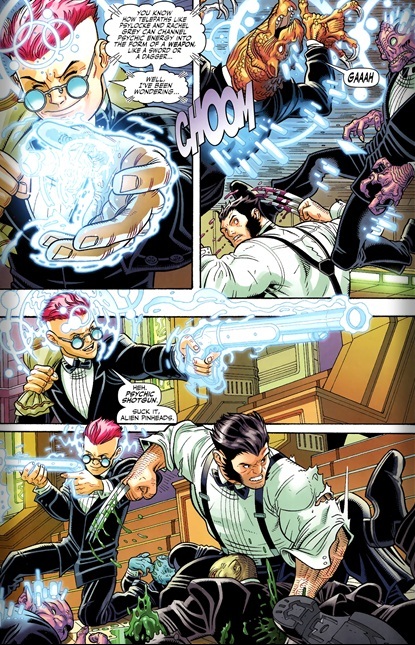 Meanwhile when Kitty’s life is in danger Broo goes feral and almost kill’s the professor. Thankfully beast manages to stop him in time. In the aftermath Kitty Kisses Iceman while Warbird watches jealously from the sidelines. Krakoa solves the school’s money problems by producing an endless supply of very large diamonds. In space Wolverine and Kid Omega head back to the school after an unsuccessful heist with Wolverine’s lower body contorted and badly injured. Cover- It’s been awhile since I’ve seen a cover literally split in two. 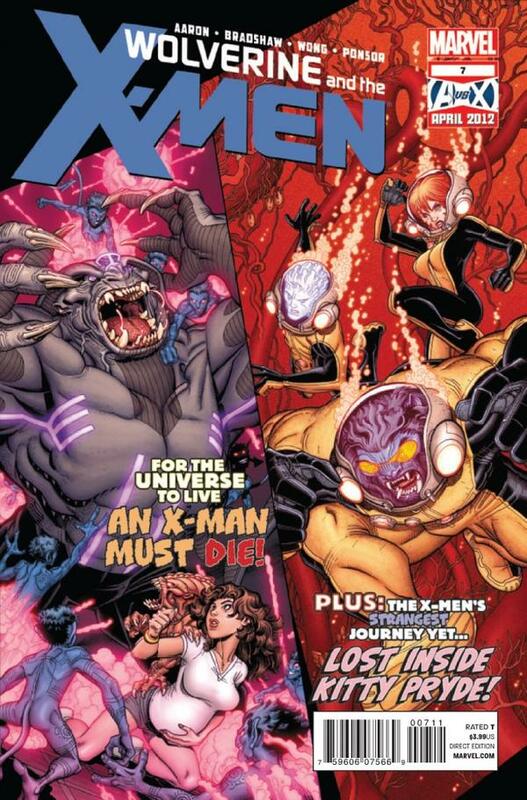 On one side we have Broo, kitty and the Bamfs vs the Space monster and on the other The X-men on a journey inside Kitty Pryde. Nice contrasting colors and great art from Nick Bradshaw. Characterization- Broo the mutant Brood takes center stage this issue as the story proves he isn’t as different from the original Brood as the X-men think. He may actually be more dangerous than they realize (As I realized in issue #1). Professor Xanto Starblood makes for a very interesting read and fine new addition to the galactic marvel Universe. The revelation that he’s a scientist here to preserve the natural order of things was a hilarious twist that fits right in with the chaotic nature of this book. The budding love triangle between Kitty Pryde, Iceman and shiar born Warbird will only add to the chaos but this book is all about being a parody of old X-men tales so let’s just go with it. Art- Nick Bradshaw how I love your art on this book! Well realized character expressions, proportioned people and nice fight choreography. If your into books with a serious tone this is not for you. Wolverine and the X-men is allot like scary movie it doesn’t take itself seriously and it’s a self contradictory parody of old x-men tales (love triangles, wolverine being a bad influence on teens, Shiar warriors mating rituals etc).